Card Text Play/Fight/Reap: Destroy the least powerful creature. Flavor text One takes away. 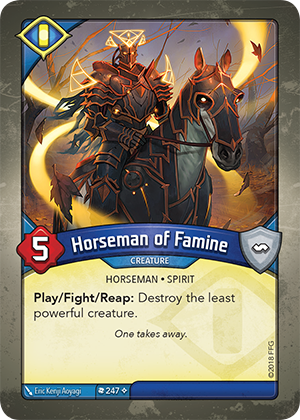 What happens if I trigger Horseman of Famine’s “Play/Fight/Reap:” ability and there are multiple creatures that tie for least powerful? The active player chooses. If an ability requires the selection of a single least powerful creature, and multiple creatures are tied, the active player chooses one.